This has to be my favourite one so far. I love all about it: the colours, the materials. This wreath is made and sold in Blessed Burlap Etsy shop. Very trendy this year, vintage baubles also look good mounted as wreaths as shown in this squidoo post (picture by Georgiapeechez). If you love yarn and pastels, you will love this one by Life Through the Lens. And there is tutorial for you to do the same! The silver star wreath is on sale on Creative Decorations. Isn’t it pretty? For more of the treasures I found around the web, you can check out my Christmas wreaths Pinterest board. 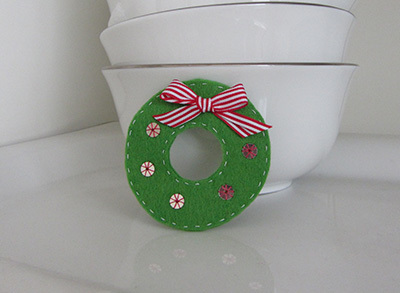 I love the bobbins wreath! I agree, this is my absolute favourite!